Access important documents first hand, in your hand, right away. 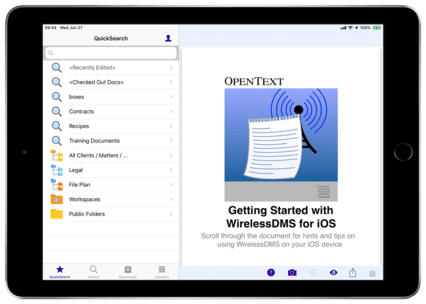 WirelessDMS is a suite of products from Matrix Logic designed to enhance OpenText eDOCS DM by allowing you full access to your documents from many different devices. WDMS extends the reach of your document repository. It allows you access to key information from a mobile device. Now you can access your documents without starting up your laptop! WDMS allows IT staff to deploy wireless document access to many different users of many different devices, from one suite of easy to install software. Since WDMS translates requests to and from your wireless device, any changes in your eDOCS repository are immediately visible from your device. You may connect from many different devices, including smartphones and tablets running iOS from Apple, Android, Windows 10, macOS. The list of supported devices is growing all the time. Download a copy of any DMS document to your mobile device (e.g.iPhone, iPad, Surface) wirelessly. Upload edits or profile new documents from your device using our Guided Profiling™ feature. Access documents by opening a DRF in your email. Matrix Logic’s Wireless Document Management Suite is modular and can be installed on one server with a simple Windows Install. Modules are licensed separately on the server. Devices are supported via Native clients, except Microbrowser over the web. This enables the support of many different devices, and in some cases, provides a choice as to whether the user connects via a built in service or an additional service option. For example, most common devices (iPhone, iPad, Android, Windows 10/Surface) are supported with our native clients, all via our Device Server module. Other less common or embedded devices that contain almost any browser rich or light, can connect via the Microbrowser Module. The Device Server and Microbrowser are server based, .NET applications. Matrix Logic’s Wireless Document Management Suite is designed to run on existing DM servers/webservers. It does not need additional hardware, or runtime infrastructure. We designed WirelessDMS to be light and small on both the server and on the client device. WirelessDMS uses the smallest amount of bandwidth to assure good mobile performance for a cost-effective solution.